Zwetschgendatschi as Germans and Bavarians call it, or Zwetschgenfleck as we Austrians are calling the Zwetschgenkuchen more often, is a very nice summer cake. Especially when fresh prune plums (italian plums) are available. Because right now (August) you can get the plums fresh, right from your local farmers market (like we are getting ours from Gerardi's Farmers Market, here on Staten Island). So August is a great month in New York City to go with this fruity and sweet coffee cake. Of course this German plum cake with crumble is also a nice dessert. Like when you are out for a pic nic. You can just cut the cake into handy pieces and everyone can just grab one piece after a little outdoor snack. Serveral different varieties of Zwetschgendatschi recipes are popular in Germany and Austria. We are baking our personal favorite today. The Streusel-Zwetschgenkuchen made from a nice yeast dough. Put all the ingredients for the dough into a mixing bowl of a stand mixer. Turn on the stand mixer on lowest speed for about 2 minutes. Now turn the stand mixer on the highest speed for about 8 minutes until the dough gets a smooth surface and removes itself from the mixing bowl. Cover the mixing bowl with a dish cloth and let rest at a warm place for about 30 minutes. Wash the plums under hot water. Remove the pits, the stems and the annoying stickers from the peel. Cut plum halves into 1cm (3/8 inch) thick slices. Sieve flour into a bowl. Add granulated sugar and ground cinnamon to the bowl and mix it (just stir it in with a spoon or so). Now melt butter and let the hot butter drip over the flour-sugar-cinnamon mix and stir with a FORK. But not too much. This way you get the little crumbs. Take the dough out of the bowl and place on counter top. Cover the counter top with flour and roll out the dough a little bit. Now take a non-stick baking sheet liner that fits a "half sheet pan" (18 x 13 inch) and put the dough on the liner. Roll out the dough on the liner so that it will cover the complete liner. Pull the liner with the dough on it onto the half sheet pan and press the dough against the walls of the baking pan. Take the melted butter, the 50 gram listed in "for the filling", and brush the dough with it. Take the plum slices and cover the dough with the plums. Set them tightly together. Take the crumbs and with your hand crumble them over the plums. Put the cake into the preheated oven for about 20 - 30 minutes. But please trust your eyes, don't rely on any numbers regarding temperature or time mentioned here, and bake the cake until it has got a golden brown crust on the sides. Remove from the oven and immediately dust with ground cinnamon and powdered sugar. But only a LITTLE BIT. Not too much! An Guadn! Bavarian for "Enjoy your meal". And if you don't have a farmers market around where you get fresh plums or if you just don't have the time to bake this delicous German cake, we bake it in our little bakery for you. For your birthday party, office catering or even if you have a little cafe where you would like to offer Zwetschgendatschi with your delicious coffee, contact the 2 PENZ and we make you a quote for local NYC delivery! Enjoy your home made Zwetschgenkuchen! And so we'd like to serve you with a recipe for a great summer dessert. The Blueberry Strudel, which is called Blaubeerstrudel in Germany and sometimes also called Schwarzbeerstrudel in Austria - even though the berries used are blue berries and not blackberries. Strudels are great in summer because you can take advantage of all the seasonal fruits. Fill your strudel with apples, cherries, blackberries or even kraut to make a savory variety. Eat your fruit strudel either as a dessert or with a cup of coffee in the afternoon. Like we love to do! We call it "Kaffee und Kuchen" when we gather in the afternoon to enjoy a freshly brewed coffee along with a Mehlspeise as we also call the our pastries. Sieve flour onto a wooden working table. Make a little dent into the flour. Carefully stir oil, egg, vinegar and the required water (not the all water) into the flour. One ingredient at a time by adding water at the end. Always keep the working table clean while stirring in the ingredients (make sure the flour absorbs all the liquids before they reach the working table). Once all liquids including about 3/4 of the water are absorbed from the flour you should have a sticky dough and about 1/4 of the water left. Add the last 1/4 of water in very small quantities by carefully stirring in only as much as the dough needs so that you get a sticky dough with no flour left which you now need to knead until you have a smooth dough that makes tongues whean kneading it (I know, that sounds difficult. It actually IS and needs a lot of experience). Place dough on a wood board, brush it with some vegetable oil and cover it with a moist hot pot (heat some water in a pot on the stove, remove the water and cover the dough with the pot). Let the dough rest for 30 minutes and prepare the filling. Wash the blueberries and dry them with paper towels. Melt butter in a pan and roast the bread crumbs until they are golden brown. Let roasted bread crumbs cool before you use them in the strudel. Now definitely the most difficult part is to do. 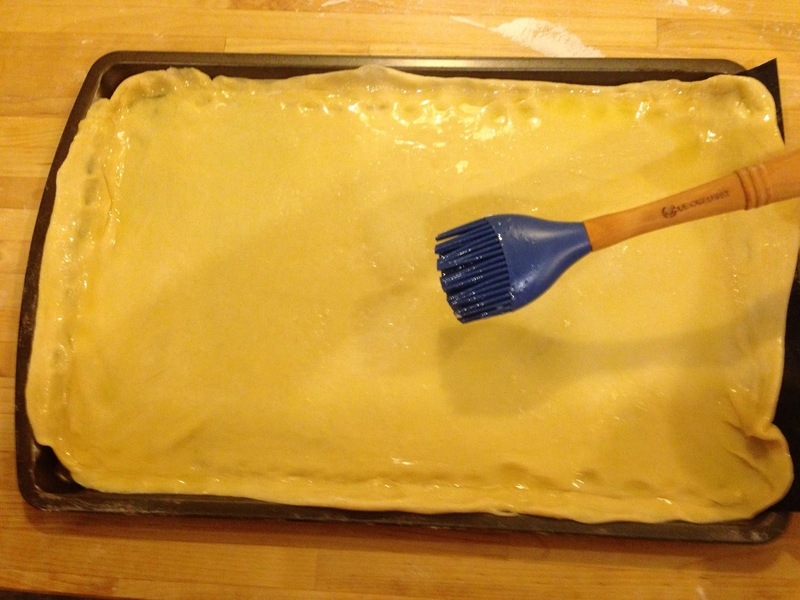 Make the strudel dough as thin, so that you are able to read the newspaper through it. Take a (approximately) 3 x 3 foot table cloth or other cloth and place it on the working table. Dust it very thin with flour. Place the dough in on the cloth and roll it with a pin until it is approximately the size of a dish. Now take the dough and "pull it out" with the backs of your hands. Similar like a pizza baker does. Place the dough on the back of one hand and with the back of your other hand you pull it a little bit. But very carefully. The weight of the dough should be used to stretch the dough in small steps. Place it on the cloth. Then stretch the borders of the dough with your fingers very carefully until you have it as thin as in the center. Now sprinkle the fully stretched dough with vegetable oil. Place the roasted bread crumbs on 2/3 of the dough and keep boarders of 1 inch around uncovered. Place the almond meal on top of the bread crumbs. Fold in the side borders (the 1 inch boarders, which you kept uncovered) and brush with oil. Roll up the strudel, beginning with the side where the filling is and roll it towards the uncovered 1/3 of the dough until you have rolled up the full strudel. Lift the Strudel onto a baking sheet with the end of the dough on bottom side of the strudel. Bake for approximately 40 minutes on 370 Farenheit in a convection oven. If you do not have a convetion oven, increase the temperature a little bit. Remove the blueberry strudel from the oven and let cool. Cut the strudel into 1.5 - 2 inch slices, dust with powdered sugar and serve with vanilla ice cream. And if you think "wow that sounds delicious, but who in New York City has got time to prepare that elaborate pastry? ", we can help you. Our handmade blueberry strudel is also available for catering and local delivery in New York City. Just contact the 2 PENZ and let us know! If you are wondering what to serve your guests for the FC Bayern München vs. Barcelona Champions League game, we have the answer. A home made "Original Wies'n Händl" would be appropriate for your fastidious guests. Also is this traditional bavarian food quite simple to make. Just add freshly boiled rice and/or fresh asparagus as a side and you have a great catering to feed the fans coming over to your VIP lounge. Properly made, this recipe for the original Bavarian rotisserie chicken, just as served at the traditional Oktoberfest in Munich, will definitely please your high maintenance guests. IMPORTANT: Brush the chicken every 15 minutes with the melted butter/seasoning mixture from the bottom of the roasting pan. This is what makes the skin crispy! After roasting this moist chicken, you have plenty of melted butter/paprika powder mixture in the pan, which makes a great gravy. Just strain through a fine mesh sieve and place in a sauciere on the table. This gravy is perfect for your sides such as rice but also for pieces like the breast. Enjoy your original Oktoberfest rotisserie chicken and the FC Bayern - Barcelona game! This year couldn't start any better for the 2 PENZ. Than with such a great media coverage about our Christmas cookie brand "Keksies". Thank you again to Alia, Jay and Michael! You've made us very proud! Because finally we received two copies of the latest issue of "Edilble Queens" by mail. We couldn't await to get these since we had the interview and the photo shoot in our kitchen, the Entrepreneur's Space in Long Island City. Weeks later we can finally hold them in our hands and are very very proud! This was the first person to person interview we gave to our valued friend Alia and also our first photo shoot. We are talking about how everything started, our vision to make our Christmas cookie brand "Keksies Weihnachtsgebäck" the most famous Christmas cookie brand in the world and more. If you are interested in the whole interview, please head over to the Edible Queens website and click the photo of the current issue to read it online. If you are in Queens, see if you can still grab one of the print copies like at our friends at the Entrepreneur's Space or the Food Cellar & Co. for example.